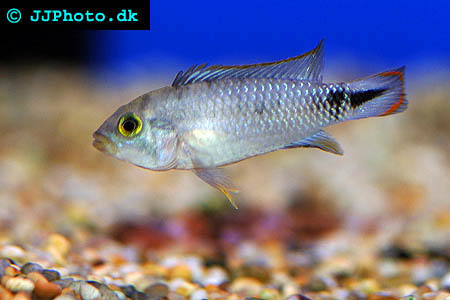 Company: Apistogramma panduro (Blue Panda Apistogramma) is best kept with other small friendly fishes. 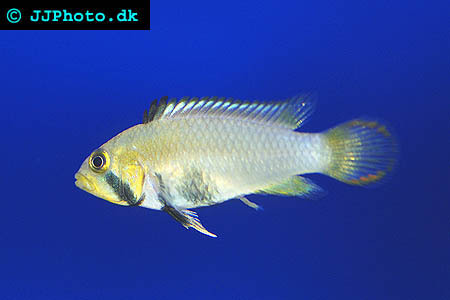 Aquarium setup: Apistogramma panduro (Blue Panda Apisto) should be kept in a densely planted aquarium tank. The aquarium should be decorated so that a lot of hiding places are created among roots and rocks. Apistogramma panduro (Blue Panda Apisto) are sensitive to poor water qualities and good water quality and regular water changes are a necessity when you keep these fishes. Feeding: Apistogramma panduro (Blue Panda Apisto) accepts flake food. They are however best kept on a diet of frozen and live food. Breeding: Use frozen and live food to get the fishes into spawning conditions. A relatively small numbers of eggs are are laid on a root. They take good care of their eggs and fry.